Fly Carbon Neutral With True Ecuador Travel! True Ecuador Travel is a "social enterprise" and part of Fundación Yanapuma, an Ecuadorian non-profit NGO (www.yanapuma.org) that is dedicated to promoting sustainable development in indigenous and marginalized communities in Ecuador. 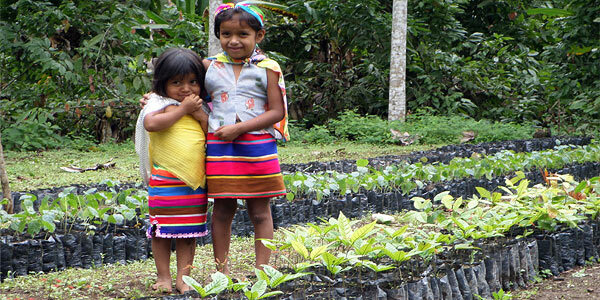 As part of our work we carry out regular reforestation projects in Ecuador. Each year we plant between 8,000 to 16,000 trees - native species to reforest river banks and protect water courses, to provide shade for cacao trees and other shade-loving crops, fruiting and other trees with edible and human use, and timber trees to provide a sustainable income for marginalized populations. Most of the trees are produced in local nurseries, providing income through sustainable micro-enterprise for rural communities. The amount of carbon offset by our annual reforestation program is enough to fly at least 500 persons from Los Angeles or 300 persons from London to Quito every year! With your help we can achieve even more! Travel with True Ecuador Travel and be carbon neutral!